Review: Colin has had nineteen Katherines, nineteen girlfriends and has bene dumped nineteen times. After being dumped by Katherine XIX, his best friend Hassan decideds that the best thing to do is go on a roadtrip. They end up in a town in Tennessee, where there’s a girl called Lindsey. As their friendship grows, Colin’s hard at work. 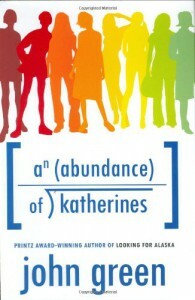 He’s got a theorum to prove-can variables be plugged into a formula to graph, and predict, any relationship?I read Ppaer Towns and Looking For Alaska and thought that they were good, but not amazing. I am looking forwards to reading Will Grayson, Will Grayson. I love the Vlogbrothers videos. I read The Fault in our Stars and practiacally died from all the feels and beauty. Mixed reacitons to John Green.An Abundance of Katherines starts quite well. Colin’s situation, that he’s been dumped many times by many girls with the same name, probably isn’t meant to be funny, because if it happened in real life it wouldn’t be, but here it is. It’s the kind of thing you’d expect from John and his crazy awesomeness.Colin is a child progidy, who wants to be a genius. Therefore, he pushes himself a lot. I’m all for ambition, but I think Colin takes it a little to the extreme at times, coming across as egoistic, and annoying. He’s also a little bit whiny, which comes from his wanting to matter in the world. You do feel sorry for him a bit, but at times, I wanted to slap him.Hassan is the general opposite. His sarcastic comments and livelyness is really nice. It’s also nice to see an Arab-American as a main character, something that should happen more on our white-centric bookshelves. Lindsey Lee Wells is cool. I’m not saying that just because she lives with her mother, Hollis, in a pink house. But I liked her personality, and she makes a good friend.The setting is really vivid. The atsmosphere of Tennessee is really good (at least, I asusme it is. I’ve never been to Tennessee, or indeed any part of America. But the general atmosphere seems right for this book).The plot...there wasn’t much of it. I couldn’t get into the storyline. There weren’t any stakes, and I didn’t see hwere it was meant to be going. It felt a bit like a cutout of a diary (except for it being in the third person) of a part of someone’s life, which is important to them, but not to the rest of us.The maths is really complicated. I followered it to a point, but ended up thinking “it probably works”. It’s nice seeing Colin’s dedication, and it comes to a nice, but not really epic conclusion.With the writing, the prose isn’t that amazing. The shedload of factnotes are a differnt matter, rivalling the hilarity of Good Omens’ footnotes (something which I wasn’t sure was possible).Overall: Strength 3 tea to a story where there’s not much happening, but a good story of friendship.